Fathers Day is just around the corner. Many kids are often faced with the situation where they want to give their father something but don’t have a lot of money to spend. Meanwhile many parents don’t want their kids to spend lots of money on them and often prefer something handmade with love. Why not encourage your child to make something for their father’s day gift instead? Try out one of these two options! Most of us may already have these materials at home, but if you don’t all of this will cost less than $10. These items can be purchased at office supply stores, Walmart, Target, and dollar stores. 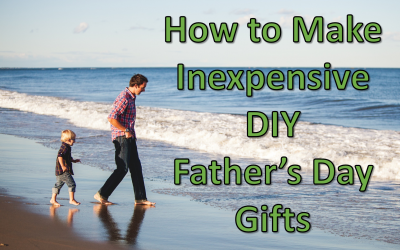 A very affordable, custom, hand-made gift with love for Father’s Day. What more could a father want? You’ll need three pieces of construction paper, scissors, glue stick and coloring utensils (color pencils, crayons, markers). Hold your construction paper in the landscape format. Landscape is horizontal and your paper should look wide not tall. Place one paper to the side for now. Fold the left side of your paper to the right side. Before pushing the folded end down, make sure the paper is evenly folded by lining up the 2 corners that you are folding. Then push the folded end of the paper down, creating a crease in the middle of paper. Step 3: What’s going to pop! On another piece of paper draw a picture or write a short phrase. Some example of short phrases are: Best Dad Ever! ; I Love You! ; Happy Father’s Day! I chose the phrase Happy Father’s Day! Cut around each word of your phrase. Cut lines into your folded paper. Cut as double the amount of lines as you have cut outs. 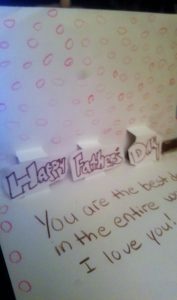 Since I am writing “Happy Fathers Day” I will cut 6 lines since I have 3 cut outs, one for each word. 1.) Happy 2.) Father’s 3.) Day. Push in the paper between each line you cut. Open the folded paper, You should have popouts for each cut out you have. I have 3 popouts. Glue your picture or phrase onto the pop-out spaces. Step 7: Write a message to your dad. Above or under your popout, write a nice message to your dad. Step 8: Draw a nice cover. Use the folded paper you placed to the side to draw a nice picture for the front of the card. Step 9: One last step. Glue the 2 folded papers together. You are finished. The cost of elmer’s glue is around $3.50, $3 for wooden beads, and $9 for craft popsicle sticks. The brown spray paint I used was non-toxic and cost $4. 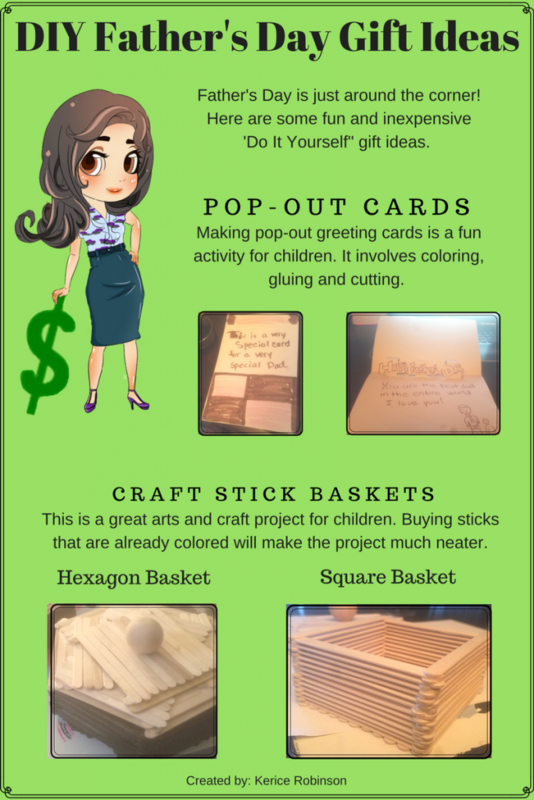 The craft sticks can be purchased in color or natural wood from stores like Michael’s, AC Moore, JoAnn Fabrics, or Amazon. If you purchase these materials from a craft store like Michael’s or JoAnn Fabrics, there is usually a 40 to 50 percent off coupon on the store’s website. A fathers day basket is a great gift for any father with something to put somewhere. They can use it to put thier keys in or hold pencils, etc. 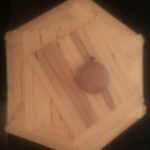 You can make a square or hexagon basket. I did both! A square is a simple shape to make. You can get away with only buying a bag of 100 sticks instead of 300, if you choose to make a square. Step 1: Gather all of your materials. Glue (elmer’s glue is strong enough), wooden bead and crafts sticks. Step 2: Prepare your base. Take 2 sticks and add glue to one side of both sticks. Step 3: Create your base. Place as many sticks as you can across the 2 sticks with glue on them. The 2 sticks with glue should be far apart, but close enough for the other sticks to lay on both of them. 11 sticks fit across my base. I used sticks that are 4.5 inches long (you can choose to use longer or shorter sticks, depending on how large you want the basket to be). Flip your base over, the 2 beginning sticks should be facing you. Put glue on the 4 corners of the base. Add 2 craft sticks on the opposite sides of the 2 beginning sticks. They should be overlapping. Step 5: Build high walls. Repeat this step several times. Glue all 4 corners, and add 2 sticks at a time, until the sides are as high as you desire. Step 6: Create a Lid base. Your lid or cover will be the same as your base. Use 2 beginning sticks, with glue along the entire surface. Glue down as many sticks as you can, creating a bridge. Step 7: Add a knob. 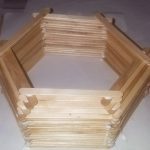 Count how many sticks are glued along your base. If you have an even number of sticks, place your wooden bead in the middle of 2 sticks. I had 11 sticks. So, I glued my wooden bead on the 6th stick. This was the center of my cover. Step 8: Let it dry! You are finished, if you want a light wooden look or used colored sticks. Step 9: Optional: Spray paint. I used the color Kona Brown. Make sure you have a covered surface to avoid permanent damage to tables or floors. It is recommended that this is done outside (even if you use a nontoxic spray). 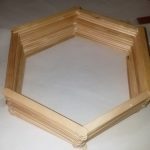 A hexagon is a six sided shape and you will need to be more attentive to symmetry when making a hexagon shaped basket. You will need 300 sticks. Step 1: Gather all of your materials. Glue (elmer’s glue is strong enough), wooden bead and crafts sticks. Step 2: Prepare your base. Take 3 sticks and add glue to the 2 farthest sides of all sticks. Place these sticks apart as if you were making a hexagon with 3 sides missing in-between. Grab 3 more sticks and fill them in; they are the missing sides of the hexagon. These sticks should create a bridge. Step 3: Your base is your wall. Build it high. Repeat this step several times. Glue all 6 sides. Take 3 sticks at a time and create a bridge from one side to the other. Step 4: Build straight sides. If you are making the bridge correctly, there should be space between each stick below and above. Remember to watch your symmetry, before the glue dries adjust your sides to keep a hexagon shape. Step 5: Create a real base. Once you have about 2 to 3 inches of height, you should begin to build a base. This is done by placing your sticks slightly closer to the middle. Glue all 6 corners, close to the inside edge. Place 3 sticks by the edge. Repeat this process and move closer to the center each time. Step 6: Create a square base. Use 2 beginning sticks, with glue along the entire surface. Glue down as many sticks as you can, creating a bridge. Place this square on the top of your hexagon. Step 7: Create a lid/cover. This will be the same as your base but unattached. Step 7a: Use 3 sticks to create a hexagon with missing sides. Glue the 2 ends of all 3 sticks. Use 3 different sticks to fill in the missing sides of the hexagon, by creating a bridge. Step 7b: Add 2 sticks on the same 3 sides of the hexagon. Then on the other sides, creating a bridge add 3 sticks on the same 3 sides of the hexagon. Then add 4 sticks on the same 3 sides of the hexagon. Remember you are creating a bridge each time. Adding multiple sticks closes the hexagon faster, without making a tall cover. There will be an open space left. Step 7c: Fill in the open space with a square. Use 2 beginning sticks, with glue along the entire surface. Glue down as many sticks as you can, creating a bridge. Place this square on the top of your hexagon. Step 8: Add a knob. Count how many sticks are glued along the square part of your cover. If you have an even number of sticks, place your wooden bead in the middle of 2 sticks. I had 11 sticks. So, I glued my wooden bead on the 6th stick. This was the center of my top. Step 9: Let it dry! You are finished, if you want a light wooden look or used colored sticks. Step 9: Optional: Spray paint. I used the color Kona Brown. Make sure you have a covered surface to avoid permanent damage to tables or floors. It is recommended that this is done outside (even if you use a nontoxic spray).